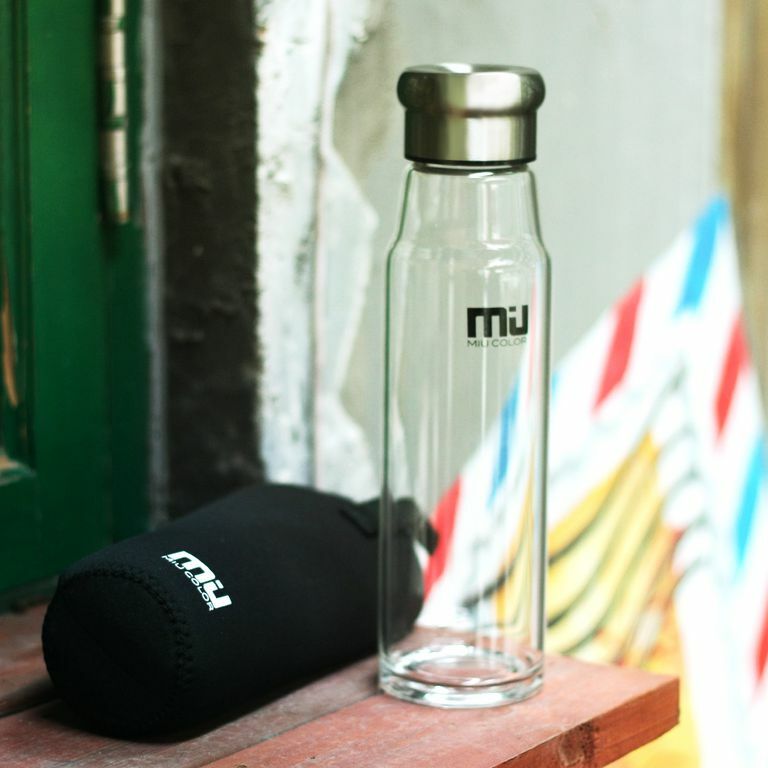 The MIU COLOR glass water bottle can work well for your active lifestyle. Glass water bottles are growing in popularity, with many traditional sports water bottle companies producing a glass version. Why would you want a glass bottle? Many people lost faith in plastic bottles due to fears about the leaching of chemicals such as BPA into their water. Sports bottle makers responded quickly to produce BPA-free water bottles, but suspicions linger. Switching to steel or aluminum bottles is one answer, but often there is a slight metallic taste left in your water. The MIU COLOR water bottle is multi-purpose. You can use it with both cold and hot beverages, which is not an option with plastic water bottles. It is made of high-strength crystal borosilicate glass. The glass has a temperature range of -20C to 150C, so you can fill it with hot coffee or boiling tea water without worry about it cracking. The stylish rounded cap is made of stainless steel with a silicone ring closure. It doesn't come with a drink-through cap, so you must unscrew and remove the cap to take a drink. That is a negative for a sports water bottle. A zip-on nylon sleeve comes with the bottle, to insulate it and provide protection. The 550 milliliter (18-​ounce) size has a good capacity for taking along water for a walking workout of an hour and is more than enough for taking along hot coffee or tea on your morning commute. What I liked best about the MIU COLOR bottle is its style. It is taller and skinnier than most plastic sports water bottles. It looks sleek and modern, yet classic. It reminds me of antique glass milk bottles, yet is thoroughly modern. It fits in your car cup holder or the bottle sleeve on your water-carrying pack. You can add ice cubes to the MIU COLOR bottle. They will fit, but the neck is small enough that I couldn't just fill it from my refrigerator ice dispenser, I had to add them one at a time. I prefer a wide-mouthed water bottle for ease of filling. There was no problem in pouring hot coffee into the bottle. The MIU COLOR nylon sleeve provides only a little insulation for heat loss, enough to be comfortable for your hand but not enough to keep your beverage hot or cold for a long time. The bottle comes with a solid cap, so you must keep hold of it while you drink. Many people will prefer drinking from the smooth glass bottle, which simply feels better than drinking from plastic or steel. The mouth is just wide enough for easy drinking without the spilling or sloshing I have with Snapple bottles. The borosilicate glass doesn't retain odors or off tastes, you often get with plastic or steel bottles. The MIU COLOR comes with two cleaning wands. While you can wash the cap in the dishwasher, the bottle is too skinny for the machine to clean it properly. The wands make it easy to hand wash the bottle. The bottle is clear so you can see whether you have done a good job. Having two wands provided make it easy to take a hot beverage on your commute, give it a quick clean at work, and switch to using it as a water bottle. I like the versatility of the bottle for both cold and hot beverages. That makes it a good bottle to take traveling and for commuting to work or school. I did not do any drop testing to see if I could break the bottle, and that would be my biggest concern about a glass water bottle. It's stylish to carry and taking a drink from it feels good. That can encourage you to save money by refilling it and reduce your use of disposable bottles and cups. Do Bottled Water Bottles Leach Bisphenol A? Is the Nalgene OTG Tritan Water Bottle Worth Buying?